The Obstinate Daughter Local Lettuces: What makes this salad stand out is that you can really taste the freshness of the ingredients. OD’s salad is all about the lettuce (thus the name) and not all lettuces are created equal, this salad uses mostly butter lettuce which has a velvety texture. The lettuce is then topped with a variety of radishes, which gives the salad a great crunch, croutons, egg, shaved cheese and coated with a green garlic buttermilk dressing. I was apprehensive about the egg, because hard-boiled eggs are not my favorite thing (its the texture that gets me), but was pleased to find that the egg yolk is shaved and sprinkled (as if it were cheese) so the texture of the yolk was not an issue for me and I found it really added richness to the dish. The couple of times I have ordered the dish I have gotten it sans cheese (my parents don’t eat cheese) and did not feel that the dish was lacking anything because all of the other elements were so excellent. Wood & Grain Mushroom Kale Salad: This salad is so simple, and yet one of my favorite things on Wood & Grain’s menu (which is saying a lot because all of their food is excellent). The salad only has a few ingredients, roasted mushrooms, kale, shaved Parmesan Reggiano and a lemon vinaigrette, but with so few items each one has to be perfect and it is. The mushrooms add an earthy quality to the salad and are roasted so perfectly that they add an almost tender steak texture to the salad. The salad base is not standard kale, but baby kale, which I think makes a huge difference. The dressing is in my opinion what really makes this salad, it is so lemony and the addition of thyme is a perfect pairing. I love this salad topped with a lot of fresh cracked black pepper. The salad is definitely a large enough portion as an entree and despite it not having any protein, is pretty filling with the addition of the mushrooms. Basil Beef Salad: In contrast to W&G’s kale salad, Basil’s Beef Salad has a quite a few ingredients (I worked for Basil a million years ago and had to memorize what was in each dish and the dressing alone probably has ten ingredients). Despite how many ingredients it has, the flavors go together perfectly and is just a perfect balance of salty, sweet, sour and spicy. The salad starts with perfectly grilled steak, which sits atop a bed of romaine, cucumbers, tomatoes, mint, cilantro and scallions and is drizzled with a fish sauce, chili, lemon dressing. 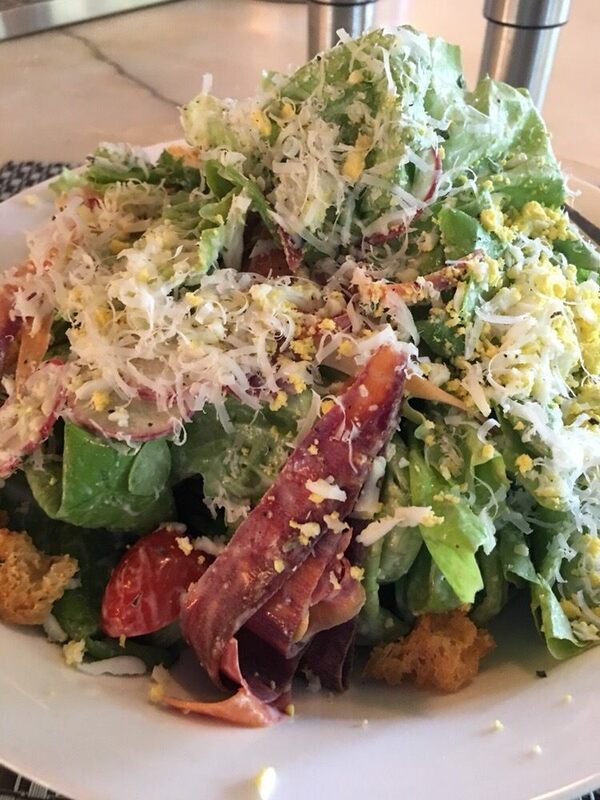 Despite its bold flavors, the salad is light and bright because of the generous use of citrus and herbs. I would consider this salad to be more of an appetizer size portion unless paired with another appetizer. There is plenty of steak on the salad though, so I get it to go, I often add more romaine and vegetables and eat the salad as an entree. Five Loaves Cobb Salad: I really couldn’t make a post about salad without including a salad from Five Loaves, honestly all of their salads are excellent. I chose the cobb because to me it’s the most filling of the options without having to add additional protein. Despite Cobb salads being a classic dish, I just started eating them because of my previously mentioned affliction towards hard-boiled eggs. Five Loaves doesn’t really reinvent the cobb salad, but they do make sure each of the elements are high quality and well cooked. I like that they use an ‘artisan green’ or spring mix rather than straight lettuce. The bacon is nice and crispy and the chicken is juicy and flavorful. I also like that they are quite generous with their avocado portions on the dish. What really makes this salad for me is their balsamic roasted garlic dressing, the tanginess and slight sweetness really works with the funkiness of the blue cheese for me. I personally get the salad with a side of jalapenos, because I feel that it benefits from a spicy element. 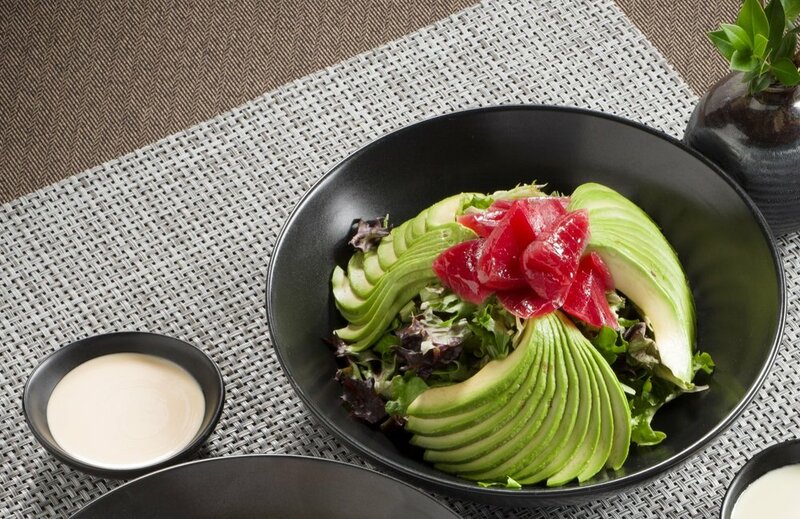 Miyabi Avocado Salad: Speaking of generous portions of avocado, Miyabi’s Avocado Salad is an avo-lovers dream come true. By the looks of it, the salad is topped with a whole avocado cut into thin fanned out portions. One thing I love about Japanese cuisine is their attention to details and presentation and this salad is gorgeous, the knife work alone on the avocado is worth the price. This is again one of those few ingredient dishes that really let each item shine. The base of the salad is a spring mix, which is topped with three fans of avocado with a mound of your choice of either tuna or shrimp (I usually go with tuna). Besides the abundance of avocado, the other element that really makes this salad stand out for me is the wasabi dressing. The dressing has a true wasabi kick, although not overpowering, that really cuts through the richness of the avocado. With the tuna option, the dish is almost like a tuna avocado roll in salad form. This is another salad that is big enough and filling enough, because of the healthy fats from the avo and addition of proteins, to be a full entree. Monza Chicken Milanese Salad: Fried chicken on top of salad is one of my favorite combos ever because of the contrasting textures and the fact that it makes fried chicken feel healthy-ish. This salad starts with a very large (seriously huge) piece of chicken scallopini. Scallopini is a thinly pounded out piece of meat that is then breaded and fried. The chicken is fried to perfection with a perfect crust and tender inside. The scallopini is then topped with arugula, capers, grape tomatoes, red onion and pecorino romano. I really like the use of arugula as the base for salads, because it has a lemony, peppery note, which I think pairs super well with fried foods. I also like that the salad incorporates elements that would typically go into a pasta, like the capers that add a great saltiness, grape tomatoes that adds a brightness and acidity and red onion and then of course cheese, because who doesn’t love cheese. This dish is a favorite of mine when I want something kind of indulgent for lunch, but don’t want to feel weighed down. 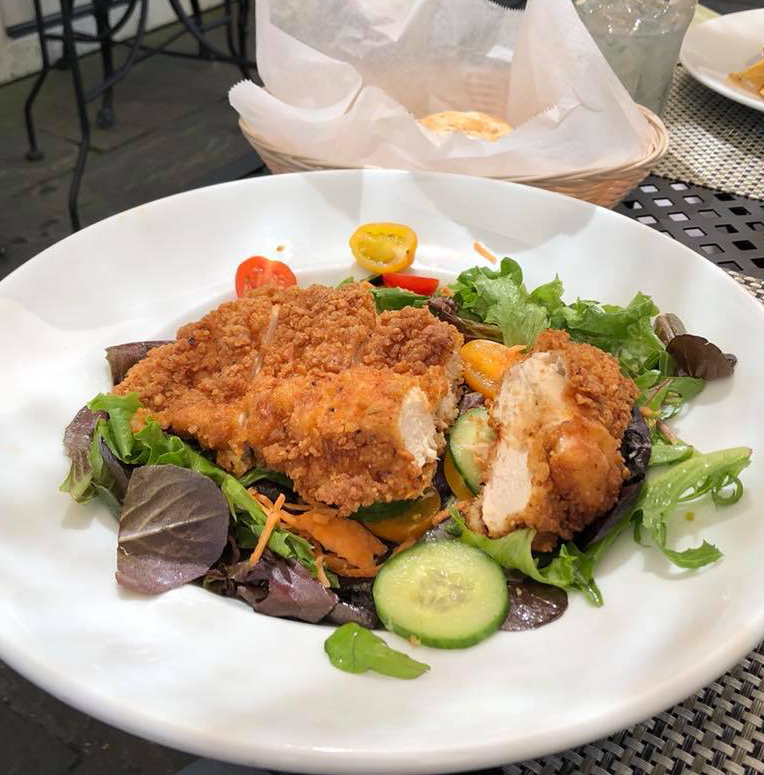 Poogan’s Porch Fried Chicken Salad: Fried chicken + salad, so nice I have to write about it twice, because I really couldn’t choose between the two. Poogan’s Fried Chicken Salad is only available on their brunch menu and actually a dish I crave regularly, which is saying a lot considering it’s a salad. Poogan’s Porch is known for the Lowcountry Southern cuisine, so it’s no shock that they know fried chicken and do it well, like really well. The chicken is so juicy, but has a great perfectly fried coating. The chicken is very well seasoned on its own, which I find to be a flaw in a lot of fried chicken. The salad is described to have seasonal greens and I have seen them vary from more of a spring mix to an arugula-esque green, cucumbers and tomatoes. As with many of the other salads, the salad dressing is for me what really makes the salad for me, and let me tell you I would definitely buy this dressing if they sold it by the bottle. The dressing is a honey jalapeno dressing and it is spot on in the balance between sweet and spicy with a slight tanginess.